Sitting nearly 93 million miles from Earth, the Sun is the focal point of our solar system with each planet and their moons orbiting around it. Even at this great distance, the Sun’s spectacular energy can pose significant risks in our world. With so much hinging on what’s happening on and around the Sun, it is critical for scientists to continuously monitor solar activity. From solar flares to solar storms, that could interfere with Earth’s electromagnetic field, providing accurate timely warnings of potentially- harmful space weather and its impacts on Earth is more important than ever before. That’s where the Deep Space Climate Observatory satellite mission, better known as DSCOVR, comes in. When it launches in early 2015, the DSCOVR satellite will continue monitoring the constant stream of charged particles from the Sun, also called “Solar Winds.” These observations are the backbone of NOAA space weather alerts and forecasts. Located approximately one million miles away, DSCOVR will orbit the Sun in a fixed position relative to Earth. 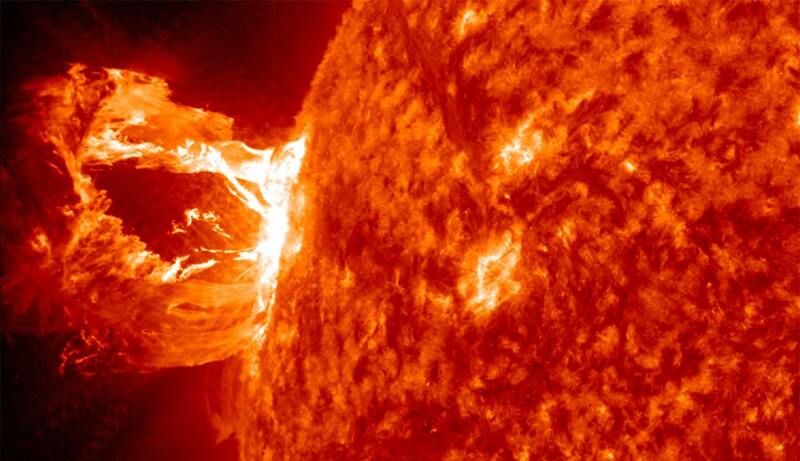 Experts estimate the most extreme solar storms could cause one to two trillion dollars in damages and require a decade to recover. DSCOVR will join two NASA missions: the Advanced Composition Explorer, or ACE, and the Solar & Heliospheric Observatory known as SOHO, and will also host NASA funded secondary sensors for Earth and space observations. NOAA Will manage DSCOVR and use its Space Weather Prediction Center to distribute critical space weather data to users within the United States and around the world.